Clay Aiken – Jukebox or Tried and True? “Suspicious Minds” is a song written in 1968 by Mark James (aka Francis Zambon). Performed by Elvis Presley in 1969, it became one of his most notable hits. Suspicious Minds was widely regarded as the single that jump-started Presley’s career after his successful 1968 Comeback Special. It was Presley’s last number-one single in the United States. On their list of the 500 Greatest Songs of All Time, Rolling Stone has Suspicious Minds ranked at #91. Elvis first performed Suspicious Minds at the Las Vegas Hilton in July of 1969. The single was released in the fall. It reached number one in the United States in the week of November 1st. This song was Presley’s final number-one single in the U.S. before his death. 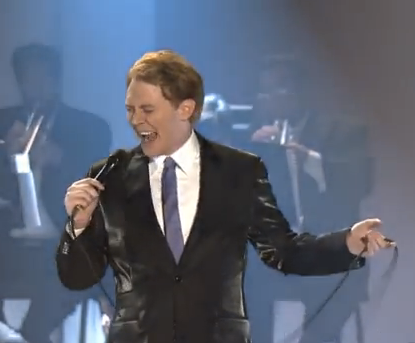 Clay Aiken first performed Suspicious Minds as a part of his Jukebox Tour in the summer of 2005. On July 29th, Clay performed the song on Good Morning America’s Summer Concert Series. The performance received a great response from the audience and the chatter on all the Clay Boards was full of excitement. Flash-forward to 2010 and Clay Aiken’s newest CD, Tried and True…. Suspicious Minds is one of the most popular songs on this album of classics. Although the song is the same, the arrangements of both performances are somewhat different. It is interesting to hear the differences. There are two performances below. The first is Clay’s performance at GMA and the second is from the taping of the Tried and True PBS special. Which performance is your favorite? I guess the tried and true is better, but Clay has an amazing voice and everything sounds great.. Suspicious Minds performance that I really, really love is the Timeless Tour's Chautauqua one, which was video taped by Scarlett. Clay appears so relaxed and expressive in it. He is such a fantastic performer and his voice is always amazing! I love both, but my favorite is the TNT one. It is really very classy in deed! I love them both. Just shows how he has grown in the last 5 years. I love them both too, Clay Aiken makes very song his own! Both renditions are great and the current performance is the better version. I love the new mature Clay voice of TnT. He doesn't just sing, he lives it and feels it. Boy hard to pick. Since I lvoe the current Clay, I guess I'll pick TNT. Very hard to pick..as I loved the JBT also. But, OMG, what a difference in his voice now. I don't know, but can it get any better or sexier? I love the look and the voice of the TNT Suspicious Minds. I think I will go watch it again. I think the Tried and True version just has a little more polish. But they are both great. If forced to choose, I have to say that I prefer the maturity of the 2010 version, but they are both long time faves of mine. Error: Error validating access token: Session has expired on Tuesday, 21-Aug-18 16:13:01 PDT. The current time is Thursday, 25-Apr-19 22:42:44 PDT.